The U.S. Marine Corps (USMC) updated its hair regulations recently to include Locks (Dreadlocks/Sisterlocks®) and Twists (Two Strand Twists/Flat Twists). The final approval was given by General Robert B. Neller (37th Commandant, USMC) once the results of Uniform Board 214 and 215 was announced. This trail blazing change and addition of primary natural hair styles worn by African American Women to the grooming standards shows the military leaders of the USMC listened to their 'Natural Hair Troops' concerns. Be that as it may, if it had not been for Staff Sgt. Cherie Wright’s “perseverance and determination” with submitting proposals and doing presentations, this hairstyle policy would have never been reviewed again. Unlike the U.S.Army AR 670-1 ruling on these same hair styles being “Unauthorized and Unprofessional”, Staff Sgt. Wright's diligence to research concrete and supportive information further validated that NATURAL HAIR CAN LOOK PROFESSIONAL AND BE WITHIN STANDARDS thus adhering to the “Uniform Regulations”. "USMC have demonstrated the 'Value of Honoring Diversity' in hair texture by including Locs & Twists in their Female Grooming Standards & Regulations!" Staff Sgt. Wright said “While briefing Marines, my focus was about awareness and professionalism, Once the information and facts were presented, the perceptions of many Marines changed.” Change… It Did! And the conversations and demonstrations she involved her Chain of Command in speaks volumes and attest to the value of being culturally aware of Africa American hair texture and curl pattern/configuration. The USMC has shown courage by stepping out of their militant box and becoming professionally informed on ‘Natural Hair Care and Maintenance’. And this was all the results of a paper Staff Sgt. Wright “wrote for a career course in 2014 (which) covered everything from the psychological effects of the previous hair regs on black women to the financial losses they suffered to the challenges they faced when deployed”. Knowledge and truth has overcome the personal perceptions of some individuals within the ranks of the USMC as this unprecedented update within their branch of service Grooming Standards to include 'Locks and Twists' in uniform reinforces a statement made by Col. Christain F. Wortman (Uniform Board President) “The Marine Corps works tirelessly every day to get better and to find areas for refinement or improvement". Having been a former U.S. Navy personnel and understanding the frustrations of being natural in the military, I wholeheartedly can relate to the liberation the Natural Hair Troops of the Marine Corps feel with the inclusion of the additional style options. These natural hair styles will provide the African American women of the Marine Corps who have chosen to wear their natural hair texture with a variety of low maintenance styling alternatives that are cost efficient, convenient and professional in appearance. As a Natural Hair Advocate, the NEW HAIR REGULATIONS implemented by the USMC gives me hope in that the other branches of service will soon follow suit and integrate these changes as well. 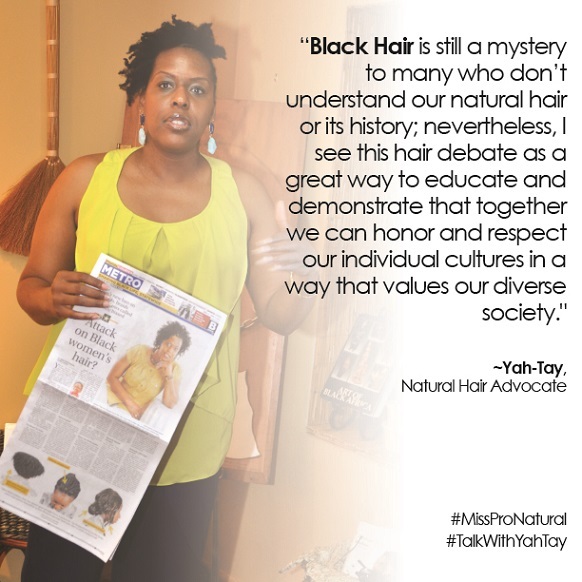 Supporting Natural Hair Sisters Who Serve! The changes are important and we can change into some new hair types and will embrace more changes in the future. Supporting Natural Hair Sisters Who Serve! These changes are very important for our #NaturalHairTroops... And "Supporting Natural Hair Sisters Who Serve" is key to validating their choice to serve their country and honor their "HAIRitage". those reading the important points found on your web site. generosity and for offering me the chance to pursue our chosen profession path. You're most welcome. Best of wishes to you and your family. Thank you! Wishing you continued success!